The original Dark Lord of the Sith stars in his first ongoing series! Ever since Darth Vader’s first on-screen appearance, he has become one of pop-culture’s most popular villains. Now, follow Vader straight from the ending of A NEW HOPE (and the pages of the new STAR WARS comic book) into his own solo adventures — showing the Empire’s war with the Rebel Alliance from the other side! But when a Dark Lord needs help, who can he turn to? 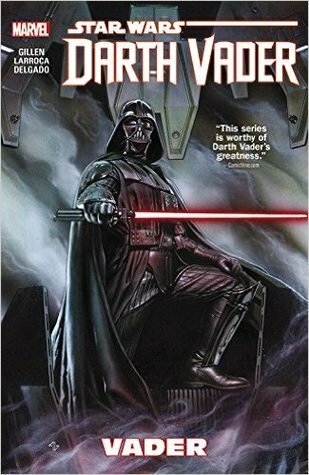 As Vader pursues a very personal vengeance against the Rebels and investigates the Emperor’s secret machinations, he clashes with weapons scavenger Aphra and deadly Battle Droids, and returns to Geonosis to build an army. But some very powerful people don’t want him to learn the truths he seeks! Guest-starring Jabba the Hutt, Boba Fett and more! I recently found out you can read some graphic novels for free thanks to Amazon Prime so I downloaded a few that interested me. I really love Star Wars so I thought this would be worth picking up, however for me to review this graphic novel I’ll need to split it into two halves. The first was a lot of information, back story, and very political. I just really didn’t enjoy it at all. I would’ve stopped reading it if it were a book but due to its form and quick readability I kept going. Luckily the second half did pick up, there was action and fights scenes which is what I expected when picking it up in the first place. It also seemed like during this second half the arc of the story that will follow was introduced and finalised a lot heavier. The way the story seems to be going in the next volumes interests me more but honestly I just wasn’t that impressed overall and didn’t do much to keep me interested in further reading. The only other bit that I thought was interesting is the new army that is being created that is neither Jedi nor Sith. But instead people were like melded together with technology to better suit and improve their own fighting styles. It was interesting for sure. Every other review goodreads has it highly rated so maybe I’m just not the target audience. Anyway I don’t have anything else to really talk about because it left so little of an impression on me. The series continues but I wont be continuing it.